I can't believe that Blake is now 18 months old the last 6 months have just whizzed by and he is changing everyday and growing up way too fast. This is going to be a rather long post so you may want to get your self a mug of coffee and a biscuit and get comfy. Blake is now in size 18-24 months clothing and has been for a few months now. He also still has his baby chunkiness. 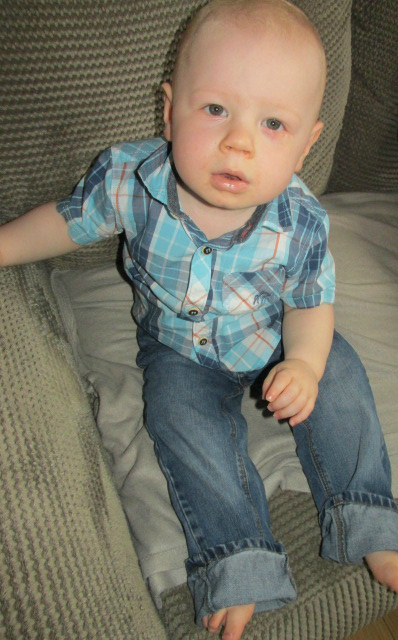 At the beginning of March we got him his first Clarke's shoes in a size 4G although he has gone up to a 4 1/2 now. He has about 12 teeth and more coming through so he has been very dribbly recently. Lucky it's not interfered that much with his sleep and he still sleeping very well at night and having approx 11 to 12 hours a sleep at night. Nap wise it really depends on him sometimes he will have a 2 hour nap and then be awake the rest of the day, other times he will have 2 naps at an hour each. So over all in a 24 hour period he's getting approx 14 hours of sleep. He has become a really fussy eater since Christmas and has gone from eating loads of different foods to hardly touching his food. He has stopped eating vegetables and has also gone off banana's which he used to love but now loves eating grapes instead but also doesn't mind apple, melon and sometimes raisins. Its so hard to know what to give him for dinner these days as he also wont eat meat unless its turkey dinosaurs or chicken nuggets. He still loves fish pie and will also eat fish fingers or fish cake. He loves yogurt but not keen on chocolate which i suppose is a good thing. He also is still drinking milk from his bottle and water from a cup. Blake still loves going to swimming lessons on a Saturday afternoon and loves splashing in the pool. We also started going back to baby beeps but after the summer holidays I'm thinking of taking him to the sessions for up 4 years. We've also started to go to a local church as they hold a little toddler group which is fun and only £1 a session. He also loves to go the park which we do quite a lot, we have a park with a sand pit and splash park which I am going to try out quite close to us. Blake also loves going to soft play and we have taken him to the farm local to us which he loves. We are planning to take him to the Zoo some point this summer and have got some other fab family day out ideas of things to get up to. Blake loves reading, playing with his trains and has been trying to slot the play coins in his laugh and learn piggy bank. We have also been practicing building blocks and I've been trying to teach him new words. 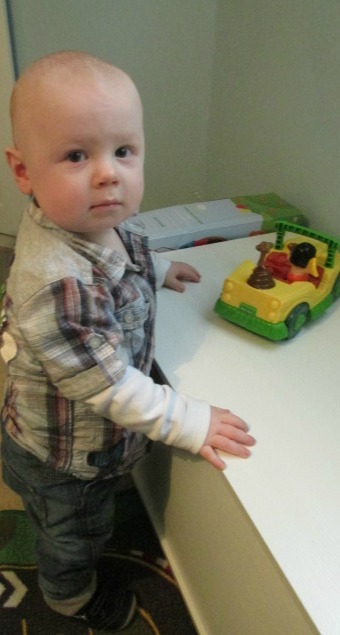 At the moment he isn't too keen on crafts but loves messy play activities. We recently got a scuttle bug for Blake to use when we take him to the park which he just loves. He currently still isn't walking fully. He is able to walk from one side of the room to the other but he is pretty lazy with it and much prefers to crawl. He loves playing ball games and is really good at throwing and catching. Talking wise he can say a few words and I'm trying to encourage him more. He can say : Mum-Mum, DaDa, Nan-Na, Hiya, No, Yay, three. Aww bless him! my son is 11 months old and I'm in no hurry for him to grow up! Aww such lovely pictures :) Time sure does fly. My eldest is 22 now!! My twins walked at different times. One at 12 months, the other at 14 months. He is just taking his time. I am so happy to read this. My daughter is 16 months old and also not walking. I know it's normal and they all do it in theor own time but it is nice to hear not every other child in the world is walking! Thanks for making me feel less alone. All 3 of my kids weren't very quick to walk, so much easier for them to keep crawling as it is much quicker for them! He will get there. It is so lovely seeing their little personalities starting to shine through isn't it? Soon enough, you will have a terrible 2, tantruming toddler on your hands!